The most effective diabetes treatment is one which helps people with diabetes lower carbohydrate intake. Eating a large amount of sugar and starch at one time causes blood sugars to spike after the meal. That large blood sugar surge then requires a large insulin response from the pancreas (or in an injection). Too much insulin then crashes blood sugar down. 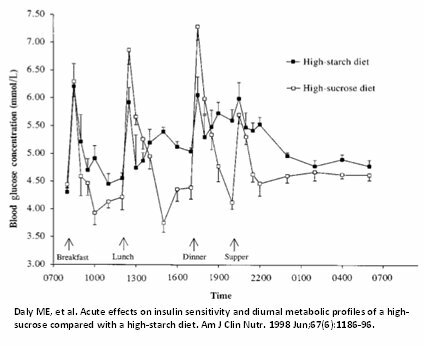 The image below is from a study which looks at blood sugar reactions to high carb meals. This blood sugar "roller coaster" is rooted in a belief in the mainstream medical community and diabetes organizations that carbohydrates should make up between 45-65% of daily calories. They try to hide this with vague language, but the 2017-2018 nutritional recommendations from the American Diabetes Association specifically says 15-20% of calories should come from protein, and 20-35% of calories should come from fats. That means the balance of calories (45-65%) come from carbohydrates. On a daily calorie intake of 2000 calories, that works out to between 225 and 325 grams of carbohydrate. Advising people with diabetes to eat 45-65% of their calories from carbohydrates causes high blood sugar (hyperglycemia) which sticks to or glycates body cells and tissues and guarantees the development of long term complications such as peripheral nerve pain (neuropathy), kidney damage (nephropathy), a loss of eyesight (retinopathy) and other common diabetic complications. Worse, for those who take insulin injections, the large doses of insulin that have to be given to match high blood sugar spikes can result in low blood sugar (hypoglycemia) episodes which are incredibly dangerous, since severe hypoglycemia can cause a loss of consciousness or death. I think one reason for this advice is a belief that at least 130 grams of carbohydrates per day are needed to keep the brain functioning. This is only true if one is eating large amounts of carbohydrate on a daily basis. The brain only needs a higher level of carbohydrate intake if the body is carb-adapted, meaning the body is having to process and store sugar and starch continually. This is because insulin levels will be chronically elevated and stored fat will be inaccessible to make ketones when food is unavailable. If a person is keto-adapted, meaning insulin levels are normal, than the body is able to make ketones to supplement brain fuel stores between meals. If a body is keto-adapted, then the brain only needs about 50 grams of carbohydrate/day, and that can easily come from gluconeogenesis. So the difference is in the primary fuel supply - carbs or fat. In my opinion, the sensible approach to managing blood sugar safely is to stop eating foods which drive up blood sugar. It's what Dr. Richard K. Bernstein in his book The Diabetes Solution calls the Law of Small Numbers: eating small amounts of carbohydrate results in the need for less insulin. Smaller does of insulin result in fewer episodes of dangerous low blood sugar or hypoglycemia. People with diabetes have a choice to become more effective in their diabetes treatment, no matter what causes the diabetes. They can start a low-carb, moderate-protein, higher-fat diet, limit carbohydrate intake to more reasonable and healthy amounts, and effectively stop the blood sugar roller coaster. Blood sugars highs will be greatly reduced and having higher blood ketone levels allows the brain to access an alternative fuel when blood sugar is too low. This means freedom from the symptoms of hypoglycemia. A ketogenic diet treats diabetes at the root cause, and is a much safer, more effective plan than injecting insulin to counteract the consumption of high-carb foods. This is true for both type 1 diabetics who must inject insulin, and type 2 diabetics suffering from too much insulin, a condition known as insulin resistance. Woman diagnosed with gestational diabetes can benefit as well, since this condition is actually undiagnosed insulin resistance, but it is treated with insulin shots. A recent paper by Feinman et al lays out the science supporting the obvious choice of a low carbohydrate diet for diabetics. Although type 1 and type 2 diabetes have different causes, limiting carb intake is the key to blood sugar control for both camps. This is especially important for children with type 1 diabetes. The danger of the type 1 diabetes diet recommended by the ADA is compounded by the fact that the ADA tells parents that children must have carbs for growth. This directive has no basis in fact and actually makes achieving blood sugar control impossible. 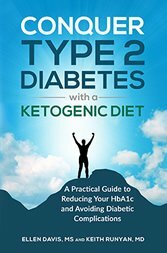 For more information on using a low carb, high fat diet as a diabetes treatment plan, check out the new book on type 2 diabetes that I've written with Dr. Keith Runyan. Dr. Runyan is a type 1 diabetic, and has much to say about this health condition in our Type 1 diabetes book as well. He uses a ketogenic diet to keep his HbA1c at 5.0 and to avoid hypoglycemia, a goal he says is one of the greatest benefits of a ketogenic diet. You can click on the book covers too. You can also listen to a great podcast conversation I did with the Raphi Sirtoli over at Break Nutrition in which we discussed using a ketogenic diet to treat diabetes and cancer. If after reading either of our books (links above and at the end of this page), you feel you need some individual attention to optimize your diabetes management, Dr. Runyan can assist you with a personal consultation via Skype. He can be reached by way of his blog at: https://ketogenicdiabeticathlete.wordpress.com/coaching/. Reduce high blood sugars and stabilize average blood sugar levels: keeping blood sugar low and at even levels throughout the day reduces the organ damage done by high blood sugar levels. Your doctor may track this with an Hemoglobin A1C or HbA1c test. This test is a measure of your average blood sugars over a 3-4 month time period. Reduce the need for large influxes of insulin: lowering insulin levels reduces the inflammatory damage which uncontrolled insulin causes to the coronary vascular system. This reduces the risk of the heart disease issues so commonly associated with diabetes. This can be tracked with a fasting insulin test, although doctors don't usually order this test. Controlling diabetes and managing blood sugar levels is not an easy task. It involves serious lifestyle and psychological changes, and newly diagnosed diabetics don't always get the correct information they need to make the best decisions. For example, identifying and switching to the most effective diabetic diet is a challenge because as mentioned, a diet high in carbohydrates makes blood sugar control very difficult. Maybe the ADA recommends a higher carb diet because they don't want to be responsible for deadly hypoglycemic episodes. But over time, high blood sugar condemns those with diabetes to diabetic complications instead. The solution is really simple. If carb intake is lowered gradually and medications or insulin doses are reduced at the same time, the patient can get off the blood sugar roller coaster. Implementing the ketogenic solution may take some work, but it is worth it. People who are newly diagnosed with diabetes are probably used to eating higher carb foods and may be used to being to convenience fast foods. After diagnosis, they have to learn how to put together and cook a diabetic meal plan and switch to a way of eating. Hopefully, the learn about and choose to eat a low carb diet. Then they also have to learn to use new tools such as glucometer and blood sugar level charts to track their blood sugar, and learn new terms such as ketosis, ketoacidosis, gluconeogenesis, insulin resistance, dawn phenomenon and a long list of other new concepts that now impact their lives. Restricting dietary carb intake results in improved blood sugar control and insulin levels: in addition, has been shown to improve the health markers for heart disease and metabolic disorders. And the effects can be maintained. This study followed a group of type 2 diabetics for almost two years, showing that improved blood sugar control with a low carb diet was possible over the long term. Here's another long term study with positive results on diabetic blood sugar control. And this more recent study shows that a very low carb, ketogenic diet is even more effective. This study provides similar results for those with type 1 diabetes. 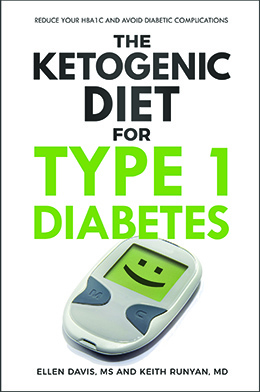 It eliminates the foods which worsen diabetic blood sugar control: a ketogenic diabetes treatment diet plan eliminates the unhealthy high carb foods which lead to blood sugar control and insulin resistance problems. Eliminating sugars and grain based foods is an especially powerful diabetes treatment step. It helps to reverse the insulin resistance at the root of type 2 diabetes: A ketogenic diet is very effective for treating the health issues associated with being insulin resistant and for reversing the symptoms of a condition known as metabolic syndrome. Lowering carb intake lowers blood sugar, which in turn, lowers the need for insulin. As insulin levels drop, the severity of insulin resistance gets better. Here's a great presentation on how Type 2 diabetes can be reversed with a low carb, high fat diet from Dr. Sarah Hallberg. Diabetes Treatments and Types: more in depth explanations about the 4 different types of diabetes on my other site, plus a blood sugar chart and other information on diabetes treatment. Dr. Bernstein's Diabetes Solution: The Complete Guide to Achieving Normal Blood Sugars by Richard Bernstein, MD. The Diabetes Diet: Dr. Bernstein's Low-Carbohydrate Solution by Richard Bernstein, MD. Atkins Diabetes Revolution : The Groundbreaking Approach to Preventing and Controlling Type 2 Diabetes with Mary C. Vernon MD, CMD.